Swedish film director Ingmar Bergman died today at the age of 89 in Sweden. I (and many others) consider him to be one of the greatest directors of all time. He made quite an impression on me when I was coming of age in the late 1960s and early 1970s. Earlier this year, I watched many of his works during a three week "Bergman Marathon." Here is my post of that wonderful experience. I think it's fair to say it was a draw. This post has inspired me to join Netflicks. I have many films I need to see. 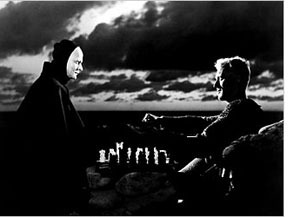 The Seventh Seal is my personal favorite. Wild Strawberries would be a close second. You broke the news to me. I hadn't heard of his passing. Sport's equal of a cinema director would have to be the coach. Although they aren't the ones performing on the field (screen), they are in charge of making key decisions, orchestrating all the team's components (cast/screenplay/soundtrack/camera angle/etc. ), and inspiring/motivating their players (actors). Bill Walsh, a man who surely brought you great joy in the 80's with the 49ers, and the 90's briefly with Stanford, died this morning after a long battle with leukemia. Stephen: You're probably right - no worse that a stalemate. David: Watching classic films (especially those from the Criterion Collection) rented from Netflix will make your brain grow. Tim: Both of those are favorites of mine as well. Alex: Good comparison between NFL Head Coach and film director. Both will be missed. Yes, he was truly one of a kind and many will mourn him. However, my fellow countryman placed his stark, permanent tattoo on movie history; his movies will live on. This is where I furrow my brow, squint my eyes, tap absentmindedly on the keyboard with my index finger...and realize that I don't have one. Come to think of it, that question is nearly impossible to answer, since each movie jostles those little grey cells, and leaves one with a chest saturated with EMOTIONS -whatever they may be. "Faithless" (2000) was the movie which re-awakened my Bergman appreciation, and a movie which probably (and hopefully) re-awakened, or introduced, Bergman awareness to younger movie fans. Watching "Fanny and Alexander" as a pre-teen, I was unable to appreciate Bergman's trademark complexity, which is why I recently re-watched it...and got homesick, but that's another story. Scanning the English subtitles I noticed that many subtle forms of delicious, weighty semantics were lost during the sometimes coarse - and sometimes inaccurate- translation. Sadly, non-Swedish speakers are robbed of the full experience. Then again, Bergman's intricate thoughts were probably not all accurately translated into the viewers' minds even in Swedish. You will be missed, Ingmar. I remembered the post, Roger. It was great back then, it is really touching now. I will remember Igmar Bergman as one of the greatest as well.